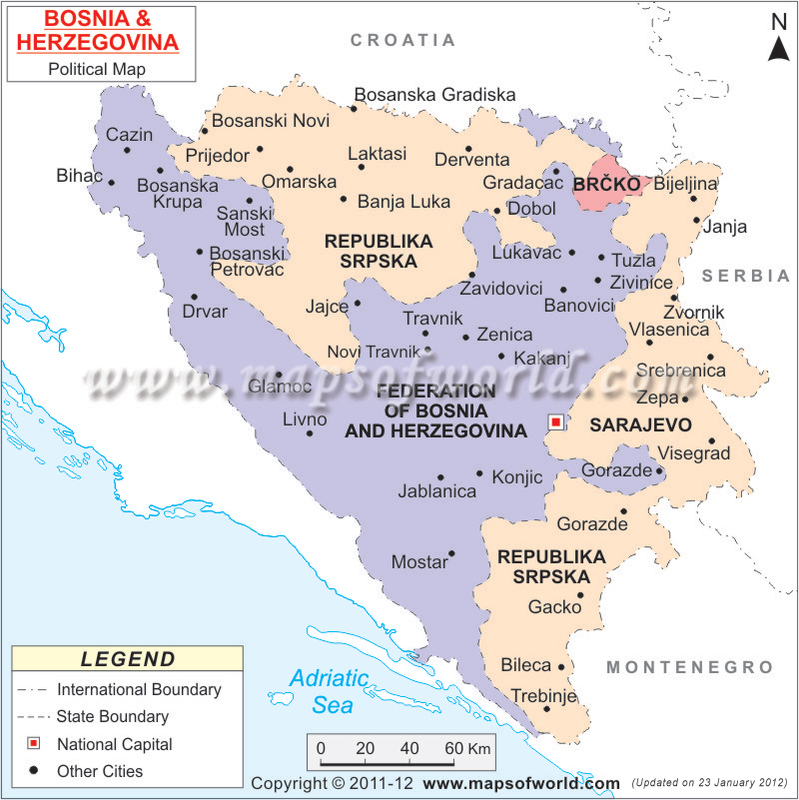 Bosnia-Herzegovina is an Eastern European country bordered by Croatia, Serbia, and Montenegro. The capital of Bosnia-Herzegovina is Sarajevo. Adopted on February 4, 1998, the National Flag of Bosnia consists of seven five-pointed white stars crafted on a blue base color. Some of the early inhabitants of Bosnia and Herzegovina were the Illyrians, a Bronze Age civilization that existed across southeastern Europe. The Illyrian civilization persisted for several centuries, establishing various kingdoms in the region. With the rise of ancient Rome, conflict grew between the two powerful populations beginning in 229 BC, and resulting in the formation of the Roman province of Illyricum in 168 BC. Continued conflict divided the region into two separate provinces: Pannonia and Dalmatia. With the breakup of the Roman Empire, Dalmatia and Pannonia became part of the Western Roman Empire. Under the rule of Emperor Justinian, the region was conquered to become part of the Byzantine Empire in the 6th century. During the Middle Ages, Bosnia was controlled by Serbia and Croatia, and later the Kingdom of Hungary. In the 12th century, Bosnia became an independent monarchy as the Kingdom of Bosnia, with Ban Boric as its first leader. From the 14th century, the Subic family and Kotromanic family vied for control of Bosnia, ending with the Kotromanic family taking control in 1322. The Ottoman Empire conquered Bosnia in 1463, ruling it for three centuries and transforming its political system and influencing its culture. The Austro-Hungarian Empire occupied Bosnia and Herzegovina in 1878, annexing the territory by 1881. Political tensions began to affect the relationship of Austria-Hungary with the Bosnian protectorate and the Serbs. The Austro-Hungarian heir, Archduke Franz Ferdinand, was assassinated by a Serbian nationalist in Sarajevo, setting off the first World War. After the war, Bosnia and Herzegovina joined the Kingdom of Serbs, Croats, and Slovenes, forming the Kingdom of Yugoslavia in 1929. During World War II, the Nazis invaded Yugoslavia, and Bosnia was ceded. At the end of the war, the Socialist Federal Republic of Yugoslavia was formed in 1946. This lasted until the collapse of the Soviet Union, when Yugoslavia broke up. 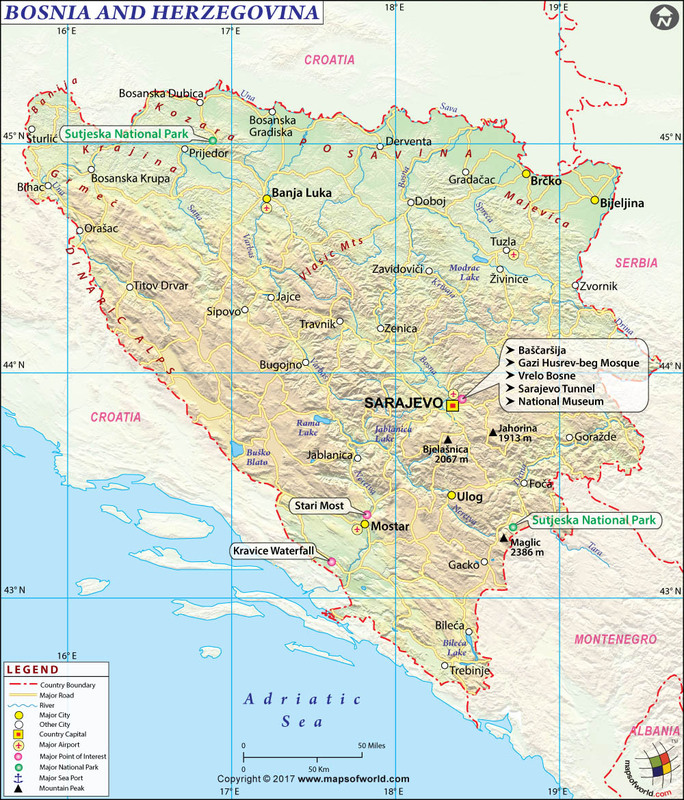 Bosnia and Herzegovina declared independence in 1992, but the Bosnian War broke out between the Serbs and Bosnian Croats, ending in 1995, after which Bosnia and Herzegovina began to work to rebuild the country. Bosnia and Herzegovina shares borders with Serbia, Montenegro, and Croatia, with a short coastline along the Adriatic. Located in the Balkans, Bosnia and Herzegovina occupy southeastern Europe. The country's terrain features the Dinaric Alps, traversing the country from east to west. The highest peak is Maglic, which stands 2,386 meters (7,828 feet) above sea level. One major feature of Bosnia's geography is its forests, which cover about half the country. Bosnia and Herzegovina features a short coastline along the Adriatic Sea, with a small stretch of land dividing neighboring Croatia's land area into two sections. The largest river in the country is the Sava, along the Croatian border, and the Bosna River is the largest contained within the country. Other important rivers are the Drina and the Neretva. The capital, Sarajevo, is a city with historical and cultural significance. At the crossroads between the Eastern and Western Empires, Sarejevo features unique architecture, with both mosques, like the Emperor's Mosque and Bey's Mosque, and Eastern markets, alongside synagogues, cathedrals, and the Old Orthodox Church. There are also many important historic locations, like that of the assassination of Franz Ferdinand at Latin Bridge, as well as significant locations from the wars that have been fought in the city. Bosnia and Herzegovina also feature scenic destinations, like Kozara National Park and Jajce's pliva lakes, which are ideal for hiking, and exploring the waterfalls and beaches. Bosnia also has several ski resorts in its mountain ranges. The main airport in Bosnia and Herzegovina is Sarajevo Airport outside of the capital, which serves major cities across Europe. Other major airports are in Mostar, Tuzla, and Banja Luka. Since Bosnia and Herzegovina was badly damaged during its relatively recent war, its infrastructure is still being redeveloped. While there are train services across the country, they are often slow and infrequent. International rail service is available from Croatia, Hungary and Serbia. Car is a potential method of transportation, but as the terrain is very mountainous and the roads are in poor condition, driving may not be the recommended method of travel for safety and time reasons. Bus service can be a good option, with some of the more modern services. Within cities, the bus systems are fairly well developed with frequent service. There are also ferries available from destinations in Croatia.